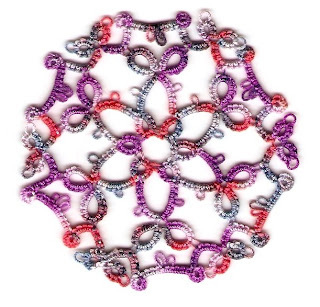 This is the last pattern in A Veritable Tatted Blizzard by Samantha Melnychuk... "Winter Crystal Snowflake." It's in Yarnplayer's Summer Trail HDT, size 20, and it measures almost 5" across. I do have one more snowflake to post from this book, "Grandma's String of Pearls." With one pattern repeat to go, I ran out of thread! Sherry to the rescue! I should have some more Seaweed any day now! As soon as I finish that last snowflake, I'll take a picture of my tree. I'll have to put snowflakes on hold for a little while then. I bartered 3 Spinning Wheel glass mats (yet to be tatted) for some Christmas presents, and I have Christmas presents started that need to be finished. Where will I find the time? 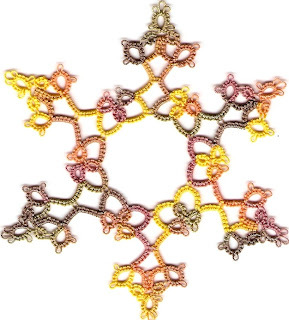 Here's another snowflake in Yarnplayer's Knitty Gritty, size 20 HDT. I love this thread! 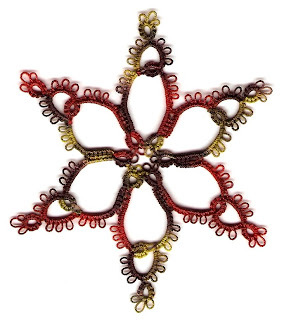 The pattern is "Feathered Star Snowflake" from A Veritable Tatted Blizzard by Samantha Melnychuk. This was a very easy tat, and I think it looks so pretty! One more to go in this book! I'm thinking of doing all the snowflakes from this book in Altin Basak #1234, a pretty blue with silver metallic accents. I love blue and silver together, and I think the Altin Basak thread would be a nice contrast to the HDT snowflakes already on my tree. I've never had much luck with metallic threads in the past, but I'm going to see how this one works out... I'll be letting you know! This snowflake was a lot of fun to tat! It's done in one continuous round. 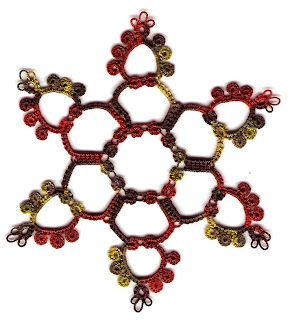 "Daisy Chain Snowflake" is from A Veritable Tatted Blizzard by Samantha Melnychuk. It measures almost 4" across. I used size 20 Knitty Gritty HDT from Marilee Rockley aka Yarnplayer. I can't believe I only have two snowflakes left to tat from this book! Isn't this one pretty? 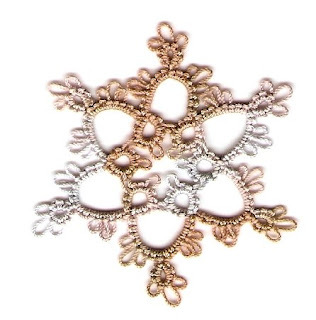 It's "Frosted Flower Snowflake" from A Veritable Tatted Blizzard by Samantha Melnychuk. I had trouble near the end... for some reason I couldn't remember how to join rings and chains. If you look really closely, you'll see a twisted ring, a twisted join, and a twisted chain. I'm assuming that most people looking at my tree won't be looking that closely, and even if they do look closely, they probably wouldn't be able to identify any mistakes (aka twisted threads)! It was pure luck that the colors of the flowers around the outside are balanced. 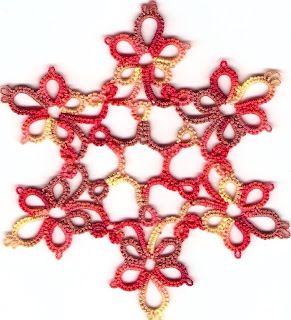 The thread is size 20 Coral Rose HDT from Sherry Pence (LadyShuttleMaker), and the snowflake measures 4" across. Dave and I agreed not to exchange Christmas gifts this year, which was a big relief to me! I'm terrible at choosing gifts for men. They typically wind up with sweatshirts and socks since none of them tat! ; ) Anyway... I got home from school Friday and found lumber in my kitchen! Dave changed his mind! I have no idea what he's making, but now I have to come up with something for him. I decided on a Bear Claw Throw (free pattern at http://purplekittyyarns.com) because I have some beautiful yarn on hand that I bought last year. The tough part is going to be finding time to make it! I may have to stay up after Dave goes to bed, and jump out of bed as soon as he leaves in the morning. I see many sleepless nights ahead! This was a quickie! 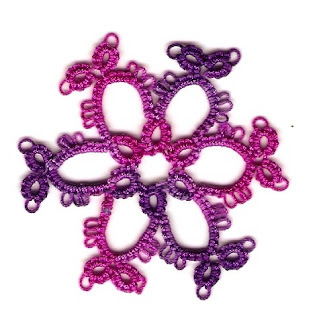 "Teeny Snowflake" from A Veritable Tatted Blizzard by Samantha Melnychuk is 2" across in Purple Punch size 20 HDT from Marilee Rockley aka Yarnplayer. 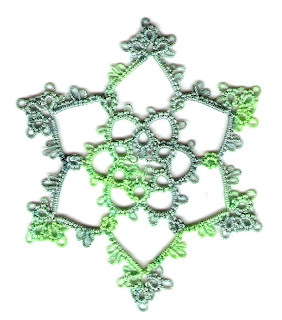 I'm having a lot of fun tatting snowflakes, and I'm learning a lot about tatting in the process. This one's "Cherub's Wing" from A Veritable Tatted Blizzard by Samantha Melnychuk. I loved tatting this one! It's about 2" across in Terra Cotta, size 20 custom HDT from Sherry Pence (LadyShuttleMaker). I love this color! This is Marilee Rockley's Purple Punch HDT, size 20. The snowflake is "Itsy-Bitsy" from A Veritable Tatted Blizzard by Samantha Melnychuk. It's almost 2" across. I figured out what I did wrong the first time I tatted this snowflake by tatting a different one. For some reason, I tatted the Josephine knot as a chain! What was I thinking? I really like the way this one turned out. This is "Kaleidoscope" from A Veritable Tatted Blizzard by Samantha Melnychuk. The thread is one of my favorite color combos... Jimmi Hendrix, size 20 HDT from Sherry Pence (LadyShuttleMaker). The finished snowflake is about 2 3/4" across. I've been trying to use up bits of leftover HDT from previous projects. I've found that one 50 yard skein has been enough to tat a Spinning Wheel glass mat and a snowflake. What a fun way to use HDT! 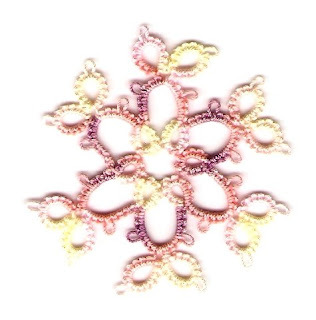 I had just a tiny bit of size 20 Rainbow Sherbet HDT by Sherry Pence (aka LadyShuttleMaker), so I decided to make a snowflake out of the center of "Harmony of Hearts" from A Veritable Tatted Blizzard by Samantha Melnychuk. This little snowflake measures about 1 1/4" across. 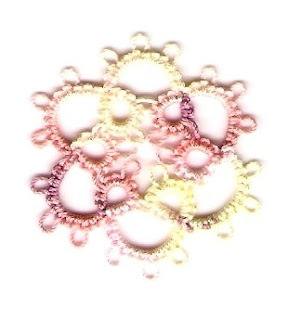 Technically, this is only the center of the "Kaleidoscope" snowflake from A Veritable Tatted Blizzard by Samantha Melnychuk. I really messed up on the second round, and rather than retro-tat for hours, I chose to cut off the second round and just use the center. After all, I do need some tiny snowflakes for the top branches of my tree! This snowflake measures 2" across. It's tatted in size 20 Rainbow Sherbet HDT by Sherry Pence aka LadyShuttleMaker. My personal snowflake challenge has begun! This is "Harmony of Hearts" from A Veritable Tatted Blizzard by Samantha Melnychuk in size 20 Seaweed, HDT by Sherry Pence aka LadyShuttleMaker. This little beauty is about 3" from point to point. Here it is... the last of my Spinning Wheel glass mats for Christmas gifts... I think! I'll need to go over my Christmas list this weekend, but I believe I've met my goal! 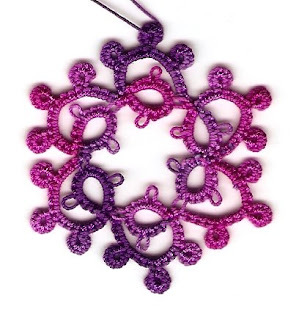 In case this is your first time reading about my Spinning Wheel quest, the pattern is from Tatting with Visual Patterns by Mary Konior, one of my favorite tatting books. 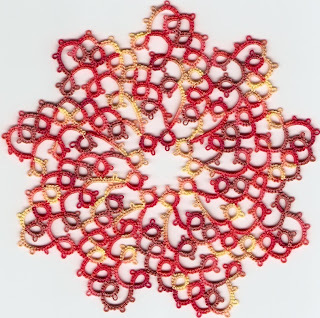 The thread is size 20 Coral Rose from Sherry Pence aka LadyShuttleMaker. I think this is one of Sherry's prettiest color combos. It's so much prettier in person! I still have four tatted motifs to finish for the grandkids' treasure boxes. I haven't decided what to make for them yet, but I do know the finished piece needs to fit a 3.5" x 5" opening. Anyone have any favorites they think I should try? I need to tat for one boy and three girls. I think I might look at Martha Ess's animal patterns... there's sure to be something suitable there! In the meantime, I have five lace projects I really need to finish knitting. Two were started before I broke my arm, three since. I also want to get started on my snowflake tree. Yes, I've been inspired by Laura, and I simply must have some HDT snowflakes hanging from a pretty little tree! Now where did I put my snowflake patterns? I love baby showers! Our new kindergarten teacher is expecting her first baby Nov. 20, but she thinks she might have him this week... full moon, you know! Any way, we're having a shower for her after school tomorrow. I love giving flannel receiving blankets and a book. This is one of my all-time favorite books, Philadelphia Chickens by Sandra Boynton. My daughters and I used to put the CD in the player and crank it up while we were cleaning. Yes, I have my very own copy! I buy one yard of fabric, cut off the selvages, and round the edges (I use a dinner plate as a template). I put a wing needle in my sewing machine, set the stitch length for a basting stitch, then go around the edge of the fabric without thread in the machine to create holes. I use size 20 crochet cotton and a size 8 or 9 hook. I single crochet in each hole and chain one between holes. Sometimes, as in this blanket, I choose an edging pattern and go around the blanket again. My granddaughter Eva still has the ones I made for her 6 1/2 years ago. They get softer with age! 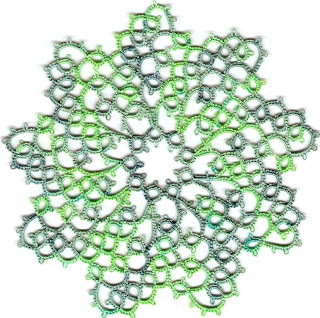 I finally finished another Spinning Wheel glass mat from Mary Konior's Tatting with Visual Patterns! This one is in Sherry Pence's (LadyShuttleMaker) Seaweed, size 20. One more Spinning Wheel to go, and I'll have met my goal for tatted Christmas presents! The last couple of weeks have just zipped by! I've had very little time to read blogs and post comments, so I've mainly been reading. The creativity I've been seeing is amazing! So, what's been keeping me so busy? Well, I've been working on a baby blanket for our new kindergarten teacher. I finished it last night... the shower's this Wednesday! It's just a flannel blanket with a crocheted edging, but I can't seem to crochet as quickly as I used to, or for as long a time. This past weekend was the middle school production of Disney's Alice in Wonderland Jr., directed by my daughter Carol. While I didn't have much to do with the play itself, I did have a minor role in working on costumes (sewing on ribbons, cutting strips of fabric, repairing torn props). I also went shopping for props with Carol. She has such wonderful ideas, and some of the items she wanted for props were a challenge to find! My favorite was the teapots for the Mad Hatter's tea party. We finally found a Mrs. Pots tea set (Mrs. Pots from Beauty and the Beast). Of course I had to attend all three performances this weekend, which severely cut into my tatting time! I was supposed to take pictures, but I forgot my camera each time we headed into town. It looks like the cold weather is here to stay in the Chicago area. Thank goodness! The weather changes wreak havoc with my sinuses. I may have to move to Alabama to be near Mom and Tattycat to preserve my poor head! The worst times seem to be when I can see a heavy bank of clouds headed our way. As the clouds move closer, the pressure in my head gets stronger, usually accompanied by intense pounding. I'm sure I'm not the only one who experiences this phenomenon, and it sure isn't pleasant! We have no school tomorrow in honor of Veterans Day. I have so much to catch up on. Where will I begin? I bought a new scanner yesterday! I was going to wait, but I found one for $44... what a deal! So, what did I scan? Another Spinning Wheel of course! I tatted this one in size 20 Summer Trail from Marilee Rockley aka Yarnplayer. 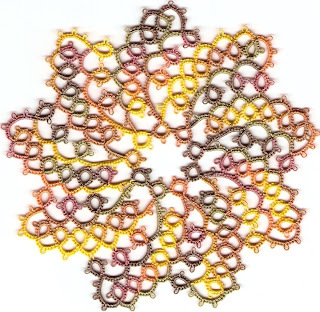 For those who have been asking, one skein of HDT is plenty to make one of these beautiful little doilies. I was also asked about the size of the treasure box Dave and I made for Sherry. Thank goodness Sherry has a tape measure, because I never measured it! Sherry checked the interior dimensions... 5 1/2" x 4" x 2". I think that's a very nice size for storing shuttles and thread, or for use as a project box. I hope some of you decide to try decorating a treasure box with tatting... I need more inspiration!